This blog contains ramblings and info on Mint 400 Records. As both the Ladybirds and Mergers & Acquisitions records are set to be re-released this May 3rd through Mint 400 Records, the label was able to catch up with vocalist Teeter Sperber and ask her a few questions about both projects. Teeter: Ladybirds formed many years ago, in 2006, after the break-up of my joke not joke mall-emo band, Ley Royal Scam. Tyler, the keys/guitar player of Ley Royal Scam, asked me sometime after the end of things if I wanted to do an electro cheezepop project and I was coasting waywardly through life, per usual, and thought it sounded rad so we did! We recorded for a month in the basement of the Creep Records house in suburban PA. Prior to the Ley Royal Scam breakup I had met Neil through another bandmate. Neil asked me to sing on his record and I was nervous as all hell to sing in front of cool dudes I didn’t know but I did it and then when the time came for Ladybirds to record I asked him to do the same! Insta besties guest starring album switcharoo style. Neil had always said that he and I should make music together outside of Fairmont but the timing never quite worked out until this past year. I was on a break from my travels and in New Jersey visiting my family and we met up and kicked out a bunch of songs in a very short time! 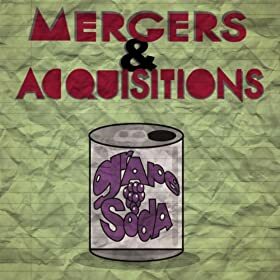 He already knew he wanted to call the group Mergers & Acqusitions, I already knew I wanted to name the album “Grape Soda” and we both already knew that we wanted to avoid being in press pictures at all costs! Aesthetic anonymity is crucial for this project, woot woot! Ladybirds and the Mergers & Acquisitions albums? Teeter: For the Ladybirds record, the people we worked with were all close friends of mine or Tylers. I had grown up being obsessed with the Get Up Kids, followed them on tour all over the world like a true spazzcore creepy superfan, so having Matt Pryor (lead singer of GUK) sing on it was like a teen dream for me. Years previously I had met Max Bemis of Say Anything when he was just a young peanut and we had became very close friends. I love his gravelly weird old-man voice and was thrilled that we were able to get him to sing on it cause that dude is super hard to track down. We got so lucky! Justin from the Danger O’s was Tyler’s Philly area mini-sidekick and Neil, of course, was always going to be a part of it. My favorite guests (besides Neil!) were the KID CHORUS, though. They were a bunch of shy ten year old kids from the record label owner’s daughter’s elementary school. They came in and sang on the song “Andy Lex” (a wicked ridiculous love song about some dude who didn’t know I was alive, natch) and to this day it’s one of the things I am proudest of ever having made, even though the actually Andy Lex is a total goofball. I love their voices so so much it hurts. For M&A, we kept it just Neil & I, but we asked ____ (golden voiced female singer from Fairmont whose name is totally escaping me, I’m so so sorry!) to do a few backing vocals to sass things up a bit. Other than that, this EP is the making of a tried and true lo-fi fantastic indie nerd duo. Teeter: Wow, main influences is a big one – I’d say it’s a toss up musically between Gaslight Anthem, this 70’s boy group called The James Boys (two pre-pre-teen brothers with giant bowl cuts wearing bellbottomed overalls singing tunes about their “Sugar, Sugar Baby” ) or a band called Milk’n’Cookies – also a 70’s teenage rock band, from Long Island, NY, total wildcat long-haired hellions, who wrote songs like “There’s Not Enough Girls in the World” and “Buy This Record and Take It Home.” Waayyyy before their time, man. Best band. So funny. Culturally my main influence is age-innapropriate teen television programming: Teen Mom and Teen Mom 2, Sixteen & Pregnant, Glee, Greek, Make It or Break It, Jersey Shore, etc etc. On a deeper level, though, I spend a lot of time volunteering for a non-profit organization called KEEN, Kids Enjoy Excersize Now, and it’s basically super fun weekly gym sessions where I go and run my guts out with kids with disabilities – anything ranging from partial blindness to Down’s Syndrome to Autism and on and on. Volunteering, in general, with anyone disadvantaged, is probably the most important thing to me in life right now. Alongside wondering what the heck happened to Leah and Corey from Teen Mom 2’s failed 6-month marriage! differences in the writing process for the two in any way? Teeter: Ladybirds we always described as “indie electro cheezepop”, “like getting hit over the head with an ice cream cone”, “Cindy Lauper meets the Postal Service on diet pills before Ephedra was banned by the FDA”, “music made for fans of Miley by fans of Jawbreaker”, etc, with covertly aggressive lyrics, whereas M&A is way less electro, more lo-fi lullabye style, and has far more sincere lyrics. The writing processes were actually super different. With Ladybirds, Tyler would write the music, we would write the vocal patterns together and, with the exception of one song, I’d write all the lyrics. The reason the lyrics on M&A are way more sincere is because Neil crafted them and he’s an effing five stars lyricist and tunemaker – so I prefer it this way to the max! Mint 400: Are there any consistent themes or topics to your songs? For Ladybirds it was standard mainstreamo-jams fare: hating on a loser ex-boyfriend, digging on a new love interest who most certainly didn’t dig on you back, silently dying while trying to make it in New York City, still silently dying while trying to make it outside of New York City, friends who steal yr identity, unicorns, glitter and dance parties. For real! were you able to overcome these obstacles? With Ladybirds/Tyler the hardest part was that he was in Gym Class Heroes and they were CONSTANTLY on tour, so the fact that he had this month off and so did I and we were able to organize our dirtbag indie rock styles and make this record was unprecedented. Having to watch Tim & Eric Awesome Show Great Job! Each night after recording was challenging too. With Neil, timing was the issue as well. For many years I’ve been a gypsy solo sojourner, touring around the US for work, never in the same state or even the same city, crazy hard to locate, keep in touch with, etc. So the fact that we were able to align and make these supersweet tunes was a miracle as well. We’d been talking about doing it for ages! Mint 400: Do you have any favorite or least favorite venues? My favorite venue, interestingly enough, is in Portland, Oregon – a place that for a short time I called home. It’s called the Doug Fir Lounge. It’s attached to this rad boutique hotel called The Jupiter and it feels like a total fancypants apres-ski lodge/regal persons mountainside living room, constructed of deep mahogany wood logs and giant fireplaces, with the best sound I’ve ever ever heard in a venue ever ever, always filled from stage to fire exit to main entrance with hipsters who aren’t too cool to dance because in Portland hipsters are different! They’re like carefree 60’s hippies wearing tiny raw denim pants and giant glasses and riding fixed gear bikes. were doing the Ladybirds and Mergers & Acquisitions albums? I’d like to thank Neil’s awesome wife Jamie for letting me stay over so late while recording M&A and for always being such a posi-sunbeam since the day I ever first met her. And Neil too, for dealing with my impossibly off key singing and for being magic enough to make it into more pitch appropriate tunery. Mint 400: And finally, any final thoughts you’d like to throw in? Industry take note! : We’re totally open to and stoked on the idea of music licensing opps for for M&A. One of our jams is called “I Must Confess” and it’s a lullabye straight out of the Moldy Peaches playbook, cepta we don’t sing about BMX bikes, and it would be effing IDEAL for any kind of GARDEN STATE/JUNO/PAPER HEART/LARS AND THE REAL GIRL/LITTLE MISS SUNSHINE soundtracking, hearmenow! In a fantasy dreamscape it would be great for Teen Mom 2 or 16 & Pregnant as well, just saying. As always, check out our other news and info on other new releases at www.mint400records.com. Also follow at www.twitter.com/mint400records and don't forget about the Mint 400 blog, message board and Facebook page. Please check out Mint 400 bands everywhere MP3's are sold.